Following the crowd can be extremely expensive in New York City. Just ask anyone who’s overpaid for breakfast with other confused souls in the Hamptons on a summer weekend. That’s why you should pause and seriously consider your options before signing an exclusive listing agreement with the first seller’s agent you meet. 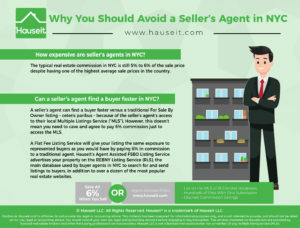 We’ll explain in this article the reasons why you should avoid a seller’s agent in NYC. Complaining or secretly bragging about how much you’ll be paying your seller’s agent is not an acceptable reason to hire a traditional seller’s agent who will take a third of your home equity in fees. How Expensive Are Seller’s Agents in NYC? Can a Seller’s Agent Find a Buyer Faster in NYC? Does a Seller’s Agent Have Their Interests Aligned in NYC? Do I Need a Seller’s Agent Who’s Familiar with My Building in NYC? Seller’s agents are extremely expensive in NYC. The typical real estate commission in NYC is still 5-6% of the sale price despite having an average sale price of $2 million. The seller’s agent will have a chance to earn the entire commission if they find a direct buyer. If the buyer is represented by a buyer’s agent, the seller’s broker will have to split half of the commission with the buyer’s agent. For the average $2 million home in New York City, the seller will face a total commission bill of $120,000 on average from a “traditional” real estate broker. This will be on top of the myriad of other significant closing costs and taxes they’ll face in NYC. Overpaying for a bagel in East Hampton is bad enough, but do you really think your friends will be impressed that you overpaid by $120,000 on broker fees? Is ignorance and profligacy a virtue? As Alexander the Great once said, “in the end, all that matters is what you’ve done.” Do you want your legacy to be one of false pride appearing real? Is the meaning of your life distilled to trying to outdo your neighbors? A seller’s agent can find a buyer faster versus a traditional For Sale By Owner listing – ceteris paribus – because of the seller’s agent’s access to their local Multiple Listings Service (“MLS”). As we’ll explain later, this doesn’t mean you need to cave and agree to pay 6% commission just to access the MLS. Note: The equivalent to the MLS in NYC is the RLS (REBNY Listing Service) which is operated by the Real Estate Board of New York. This is because over 90% of home buyers are represented by buyers’ agents who check their local MLS for listings to show their buyers. Listings in the MLS are contractually co-broked between member brokerages. This means that each listing broker is forced to split commission and cooperate with buyers’ agents. As a result, buyers’ agents won’t be afraid to show listings in the MLS to their clients as they have assurance that they’ll get paid if their buyer proceeds with a purchase. In contrast, traditional For Sale By Owner listings offer no such promise of payment to buyers’ agents. Even if a For Sale By Owner seller wrote in the listing description that they’d be willing to work with buyers’ agents or offer a specific commission, there’d still be no way to guarantee payment to buyers’ agents. Signing a FSBO commission agreement won’t be convenient because a buyer’s agent would need to sign an agreement with each FSBO listing. Why do that when you don’t need agreements at all for the 96% of all listings that are already co-broked in the MLS? Access to the MLS is the reason you shouldn’t avoid seller’s agents altogether. You simply need to understand that real estate commissions are negotiable, and that you can get the same exposure through a real, brand name broker for a fraction of the price. Furthermore, you can attract a buyer faster with a flat fee MLS listing if you’re willing to reduce the price as a result of your commission savings. Price is the single biggest determinant of how many buyers will be attracted to your listing. So all things being equal, you will be able to sell your home faster with a flat fee MLS listing at a lower price versus a traditional 6% commission listing. Hauseit offers two options for home sellers in New York City. For maximum savings, home sellers can utilize our self-service List Your Home Online option to save up to all 6% in commissions. For busy home New Yorkers who need the help of a traditional real estate agent, we’ve negotiated private label discounts with NYC’s finest listing brokers through our 1% for Full Service program. Unfortunately not. Seller’s agents in NYC have powerful incentives to get deals done as quickly as possible and to not cooperate with buyers’ agents behind your back. A seller’s agent in NYC simply wants to sell your home as quickly as possible so they’ll be paid faster. Most seller’s agents in New York City won’t sweat the additional $10,000 you might get from a higher offer if you simply waited another week. They’ll pressure you to accept the first decent offer you receive. Their calculus is simple: 3-6% of another $10,000 is insignificant versus the certainty of getting a deal done sooner and collecting that same percentage on the average sale price of $2 million. Even though co-broking is much more common and regulated in NYC because of REBNY’s strict rules and penalties, there will always be bad real estate agents who try to skirt the rules. Unethical listing agents can secretly refuse to co-broke by ignoring inquiries and pretending that they didn’t see them, re-scheduling appointments until buyers’ agents give up and generally being unresponsive and uncooperative. This is extremely unfortunate for sellers because the entire reason they were convinced to pay 6% was because they were persuaded that it was necessary to co-broke and attract buyers represented by agents. Yet the first thing some of these unethical listing agents will do is ignore buyers’ agents in the hope of collecting the entire commission for themselves. One of the most infuriating things in the world is for co-op apartment owners to be solicited by agents who live in their building thinking it’s their God given right to get the listing. Please do not fall for the scam of thinking there’s an edge for a listing agent just because they live or are intimately familiar with a building. Everything is online these days including comps, sale prices, neighborhood statistics and information about your building. There is no advantage to having seen a specific co-op’s purchase application before as they are all more or less the same. Furthermore, if your co-op board has some specific preferences or quirks, wouldn’t you also know and be able to tell your seller’s agent anyway? Don’t fall for it! The most important criteria when selecting a real estate listing agent in NYC is cost, professionalism and deal experience. 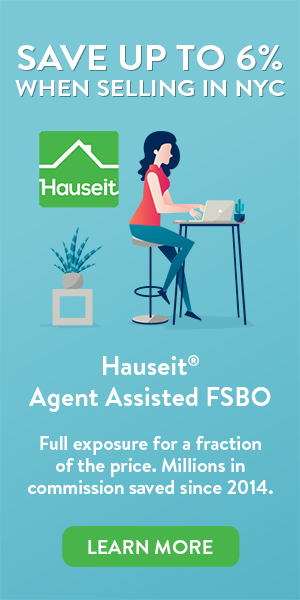 Hauseit’s broker partners are some of the most experienced, brand name brokers in New York City. We’ve negotiated significant private label discounts with the best so you don’t have to!